Policies and Regulations Since the reasons for students coming to The University of Iowa vary from student to student, it is necessary that there be an understanding of the basic regulations by which we live, work, and play. Each student is responsible for campus rules and regulations, so know the rules, and observe them! It must be evident that every well-ordered community has regulations so that the persons living and working together in the community may pursue their individual goals together in the most effective and pleasant manner possible. [italics]Personal Conduct[/italics] ___________________ The regulations governing the personal behavior of students have evolved over the years as a minimal code of behavior, necessary as a guide to intelligent adult conduct and to prevent the excesses in behavior which interfere with the purposes of an educational institution, break the public law, or damage the public image of the University. 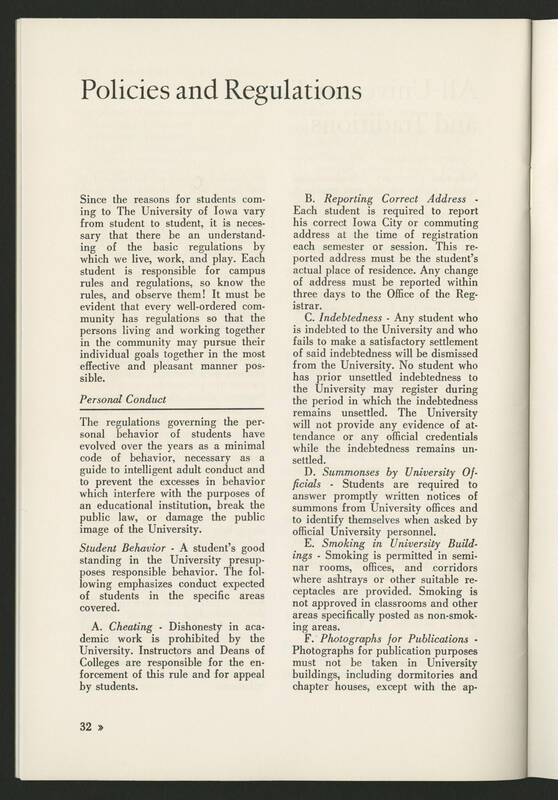 [italics]Student Behavior[/italics] - A student's good standing in the University presupposes responsible behavior. The following emphasizes conduct expected of students in the specific areas covered. A. [italics]Cheating[/italics] - Dishonesty in academic work is prohibited by the University. Instructors and Deans of Colleges are responsible for the enforcement of this rule and for appeal by students.